Okay this ‘reunion’ thing is officially getting out of control. 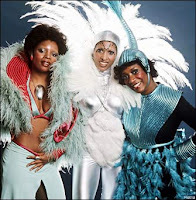 Take That, Spice Girls, Boyzone, Steps, Bros, New Kids On The Block, Bangles, Five, Aqua, East 17, The Jacksons… But now comes news that after 32 years, yes, 32 YEARS, Labelle (pictured left, following an explosion at a local bedding factory) is to make a comeback album later this year. The new album will be produced by legendary hitmakers Gamble & Huff and will be released in the United States on September 23.